Eugene Laverty on the Milwaukee Apriilia. Former World Superbike Championship runner-up Eugene Laverty has been left out in the cold after confirmation that Shaun Muir will run a BMW team in 2019, headed up by Tom Sykes. 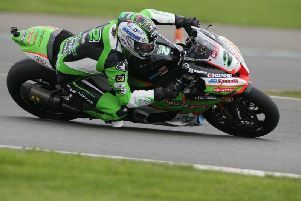 Yorkshireman Sykes has left the Kawasaki Racing Team, with world champion Jonathan Rea due to be joined by newly-crowned British Superbike champ Leon Haslam next season on the Ninja ZX-10RR. Muir has switched back to a factory-supported effort with BMW after running Aprilia machinery for two seasons. With Sykes joined in the new-look SMR line-up by Superstock 1000 champion Markus Reiterbeger, Laverty has been left without a place in the team for 2019. Toomebridge man Laverty finished as the runner-up in the championship to Sykes in 2013. He is currently ninth in the championship standings, but lost ground following a crash at Buriram in Thailand at the beginning of the season, which ruled him out of action. The 32-year-old former MotoGP rider suffered a broken pelvis in the incident in March. He made his racing return at Imola in Italy in May.